The crew onboard the Monterey — which was taking part in the 935 nautical mile Antigua to Bermuda Race race — have abandoned the vessel 200 nautical miles south of Bermuda after it began taking on water early this morning, with all the crew safely rescued by another sailboat taking part in the race. A Bermuda Maritime Operations spokesperson said, “At 5.05am, Wednesday 17th May 2017, Rescue Coordination Centre Bermuda [RCC Bermuda] received a satellite telephone call from the Antigua to Bermuda race participant Monterey reporting that the 57-foot sailing vessel with 6 persons onboard, was taking on water approximately 200 miles south of Bermuda. “The cause of water ingress was unknown as crew prepared to abandon to another race participant, Esprit de Corps IV. Using an onboard ‘yellow brick’ tracking system, RCC Bermuda was able to confirm that both vessels were in close proximity and preparing for the transfer of 6 crew. “At 5.28am RCC Bermuda received another call from the crew of Monterey reporting that all six persons had been safely transferred via life raft to Esprit de Corps IV, and that Monterey was now very low in the water. An Antigua Bermuda Race Committee spokesperson said, “The Antigua Bermuda Race Committee has been informed by RCC Bermuda Radio on Wednesday 17 May that Les Crane’s Farr PH 56, Monterey [Bermuda] had been abandoned after taking on water; the cause of which is unknown. “The crew are all safe and well having transferred onto the Volvo 60, Esprit De Corps IV [Canada], also competing in the race which was close by. 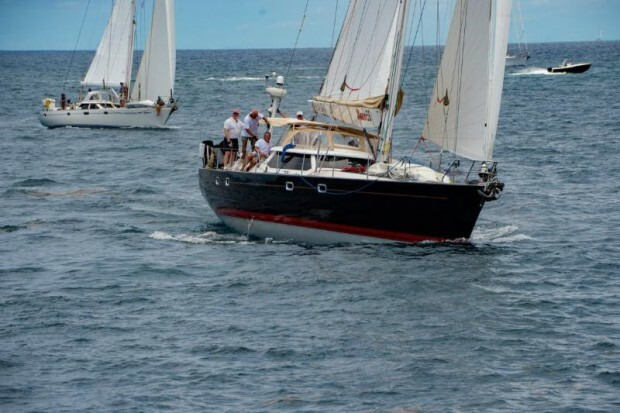 “We are saddened by the news but we know Past Commodore, Les Crane has completed many miles of ocean crossings and as Skipper we know his decision is based on the safety of his crew, and we are glad all are safe,” Commodore, Royal Bermuda Yacht Club, Leatrice Oatley said. God Bless Monterey and all who have sailed in her.